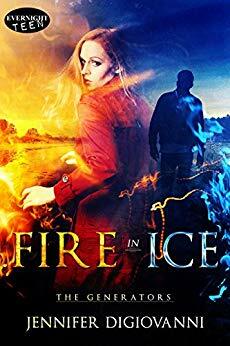 I couldn’t put Fire in Ice, by Jennifer DiGiovanni, down. It’s a quick, fun, read with excitement and romance intertwined with moments of great tension and irony created by a he said/she said dual narrative. The book dives right into the action with Cara Scotto being severely ill and waking up with strange new powers. Alex DeMarsh, a rich celebrity type, returns from prep school for winter break to instantly realize the little Cara he vaguely remembered from childhood has grown up to be hot and exactly like him, a Generator. The headstrong Cara must come to terms with being a supernatural being, gifted through her ancestry to be able generate and manipulate energy. Alex must teach her to control her energy, hide it from everyone, and he must protect her from their kind’s enemies. Only neither of them plans on the feelings that surge between them, both supernatural and natural. Tensions and dangers arise, and it becomes unclear whether they can make it together or even stay alive. At first, the narrative seemed a little too clean cut for me, without some of the detailed descriptions one longs for in a book, but the quick to the point pacing proved it to be a page turner and I enjoyed the quick chapters and plot. The dual point of view switching between Alex and Cara is what made this book amazing. I love when narratives overlap slightly so it creates this rich irony of misunderstandings only the reader is privy to. This is often difficult to do in first person while making the characters unique but DiGiovanni makes it happen. Cara is headstrong, insecure at times, and untrusting. Alex is used to the limelight but is resentful of playing a part and deep down is lonely. Frankly, he is adorably cheeky and irresistible. Overall, this novel has some familiar tropes, like the hot rich guy meets the headstrong girl and must introduce her to his supernatural world, but it felt unique and well told due to the point-of-view, strong characters, and a fast plot that leaves you wanting more. And with it being a series, readers will get exactly that. Book 2 of The Generators series, Truth in Lies, was just released on Sept. 7th. We will see Cara and Alex's relationship deepen as he tries to help her control her powers to hide the truth from others. Despite wanting to live a normal life, they fear an old enemy striking again. 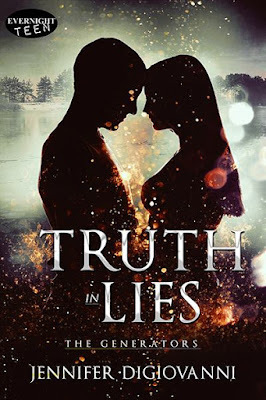 Alex must come to terms with the idea of eliminating the threat and possibly taking over if he and Cara want a chance at a happily ever after. You can bet I already bought my copy, so stayed tuned for another review this winter. Super share indeed. My mother has been waiting for this info.